Insulation, preventing draughts, and controlling ventilation can reduce the amount of heating and cooling you need in your home. reduce your heating and cooling related costs and greenhouse gas emissions. When choosing an installer, make sure they have a South Australian builder's licence that permits them to install insulation. You can check that they are licensed using the licensing public register. has been properly treated for fire or is a non-combustible product. Insulation products have a fire rating under Australian Standards AS1530.3. Insulation batts should fit snugly between wall and ceiling joists with allowance for them to expand to their natural thickness. Insulation should be kept clear of electrical equipment, for example, downlights, exhaust fans and electrical wiring. Your installer should install appropriate barriers and/or covers. You can do a basic assessment of your home to determine if your roof space has objects that may generate heat and pose a fire risk if they touch the insulation. Use the Self-assessment and installer acknowledgement form (314.9 KB PDF) so you can discuss your concerns with your insulation installer or licensed electrician. Installers can also use this form to identify hazards and acknowledge they have installed the insulation safely. 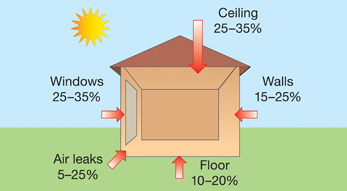 Draughts can account for up to 25% of a home’s heat loss in winter or heat gain in summer. Reducing draughts is an easy and cost effective way of reducing heating and cooling costs. evaporative cooling ceiling vents (during colder months). If you have a gas heater in your home, you need to ensure there is adequate ventilation for it to operate safely. Before you seal any exhaust fans or outlet grilles, check with a licensed gas fitter that it is safe to do so. Using airflow on summer evenings is an effective way to cool the house and occupants. 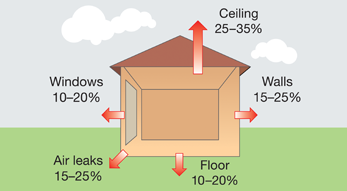 Cross ventilation occurs when two sides of the home are opened to allow air to flow, from one end to the other. The Australian Government’s YourHome website explains how you can make the most of this form of passive cooling in your home.